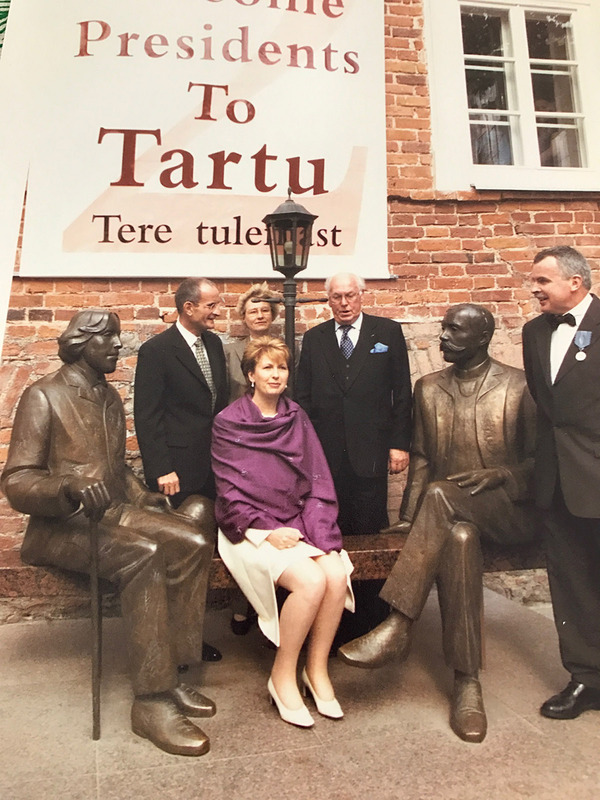 On the occasion of her State visit to Estonia,the President of Ireland Mary McAleese, her husband Martin,the President of Estonia Lennart Meri and his wife Helle & Liam Allen of Wilde Guest Apartments at the “2 Wildes” sculpture in the city of Tartu Estonia May 2001. A visit to Tallinn is a very rewarding cultural experience. Wilde Guest Apartments or Vilde Külaliskorterid in the vernacular get their name from a cultural project iniated by the owner Liam Allen and brought to life by the famous Estonian sculptor Tiiu Kirsipuu . The “2 Wildes ” sculpture which depicts the Estonian writer Eduard Vilde and the Irish writer Oscar Wilde engaged in an imaginary conversation on a park bench celebrates the rich cultural heritage of both Estonia and Ireland. The sculpture which was unveiled outside the Wilde Irish Pub in Tartu on May 30th 1999 was supported by Estonian Cultural Capital, Liam Allen, Tartu Renaissance Club and many of the citizens of Tartu. A copy of the” 2 Wildes” sculpture was presented to the city of Galway in Ireland by the Estonian people in 2004 on the occasion of accession to The European Union. These sculptures are among the most photographed tourist attractions both in Galway Ireland and Tartu Estonia. Wilde Guest Apartments Tallinn and Wilde Guest Apartments Tartu are decorated with art sculpture and furniture items collected by the owner over many years. You will find a miniature copy of the “2 Wildes “sculpture in the living room of the Panoramic View Apartment in the Old Town of Tallinn. There is also a major monument to the Estonian writer Eduard Vilde in front of the apartments on Niguliste Street, in Tallinn. A stay at Wilde Guest Apartments Tallinn Old Town and Wilde Guest Apartments Tartu is an experience not to be missed.